Mr. Kasich, joined by his wife and 15-year-old twin daughters, addressed several thousand cheering supporters inside the student union building at Ohio State University here, offering a centrist appeal designed to paint him as a common-sense Midwesterner who can fix a broken Washington. He avoided attacking President Obama, as his Republican rivals have done. In ignoring Mr. Obama, the governor may have missed an opportunity to gin up enthusiasm on the Republican right — a constituency that is already suspicious of him because of some of his moderate policy positions, including his expansion of Medicaid under the Affordable Care Act. But first, voters must figure out who Mr. Kasich is. The governor is not nearly as well known as other candidates; polls show about 2 percent of Republicans back him. A critical early test for Mr. Kasich, analysts say, will be whether he can raise those numbers enough to land a spot in the Aug. 6 Republican debate in Cleveland, in his own backyard. But it may be too late; only the top 10 candidates in polling will make the cut. Kasich aides say they are not nearly as concerned with the debate as they are with the actual first primary in February, in New Hampshire, where independent-minded Republicans — like the Ohio governor and Senator John McCain of Arizona, some of whose former advisers, including Mr. Weaver, now work for Mr. Kasich — have traditionally fared well. 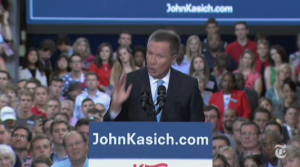 But here in Columbus, supporters see Mr. Kasich’s bluntness as an asset.